Welcome to what is now known as International Merlot Month, which annually falls into the month of October. With today being the brand spanking new Fall flavored month of the year, it's time to uncork a look at domestic Merlot. It has often been the misunderstood varietal, lacking the respect it deserves here in the U.S. after the varietal was disparaged in a now popularly iconic movie. While it elevated a different varietal to ever growing heights, well deserved of course, but wine enthusiasts losing interest in one of the more renown varietals in the world because of a line from a movie is pretty silly. But hey, that's the fickle mind of the average wandering wine enthusiast in the twenty-first century. I've been a fan of Merlot for many years now, that fascination started in earnest after spending two weeks in Bordeaux, walking the vineyards, tasting the wines of Saint Emilion, and realizing the depth and breadth of this awe-inspiring Merlot dominate wine producing region, that is centuries old. 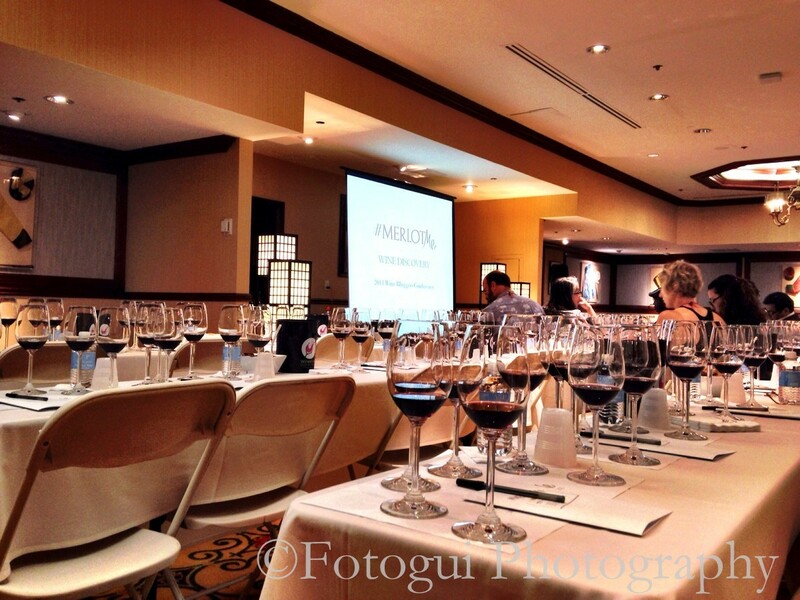 That's when it all began for me, I began to realize just how much Merlot is blended into some of the very best wines of the world, both domestically and abroad. It brings so much to the table regarding its sheer roundness, richness and easier going affability. It's often known for its softer and less tannic side than its blending partner Cabernet Sauvignon. Besides that, who doesn't like to support the underdog, the misunderstood and the breaking of myths? My second round of interest in Merlot designate wines from domestic sources arrived during a Merlot Me hashtag event, and if memory serves it was during the last Wine Bloggers Conference, I attended in Santa Barbara. Both Rutherford Hill and Duckhorn were going head to head, it was an insightfully revealing event for me and the other participants who may have sneered at domestic Merlot. 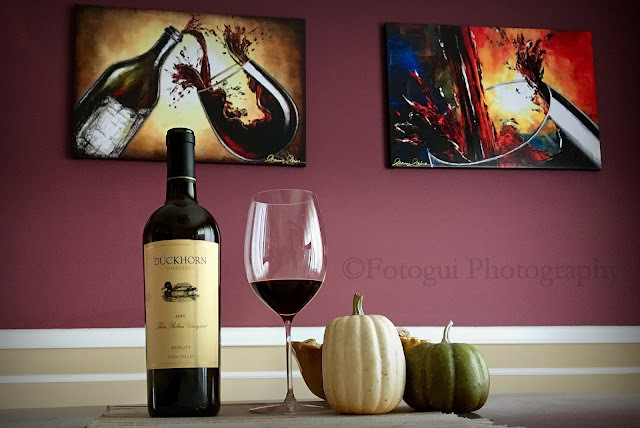 In today's Merlot Month roundup, I'm featuring one of my favorite producers in the Napa Valley, Duckhorn Vineyards. Since working with their reps back in the day, shout out to Brett if you're reading this, I've come to greatly admire the wines from Duckhorn Vineyards. I've had the opportunity over the last few years to sample a good deal of their portfolio. While their Pinot Noir via the Anderson Valley GoldenEye gets a good deal of attention, it's their staple Napa Valley Cabernet Sauvignon and Merlot that standout for me. It's interesting to note of the many times I've been to the Napa Valley, I've not been to Duckhorn Vineyards. To be honest, it wasn't on my radar, as I thought, oh, big corporate mass produced iconic Napa Valley juice, do I really want to go there? While I vilified it in my mind then, I now would welcome an opportunity to check them out more thoroughly. I received two bottles of Merlot as samples for International Merlot Month, see when you sign up the program, you never know what will arrive. There have been more than a half dozen bottles in all received to date, but of those which I've sampled thus far, I'd have to say the Duckhorn selections have been thee most impressive so far. The other bottles which will be featured in a different article, are still 'wowsers' one of my technical wine descriptor terms, feel free to look it up. That said, it's time to dive in head first to the Three Palms Vineyard. DH has been producing this single vineyard designate since 1978. I just looked it up on the K and L site, bam, they have bottles of 1986 available, holy-cow, I need to grab a bottle before they disappear. Oops, sorry about the fanboy moment, but I get excited about older vintages from historic sites. The Three Palms site is inside of the sub-appellation of Calistoga, sporting volcanic rocks which radiate day-time heat during the cool of the night, helping with ripening. A relatively small vineyard, only 73 acres, with a slight elevation of no more than a minor hill. Besides Merlot, Cab-Sauv, Cab-Franc, Malbec and Petit Verdot share space with the Merlot plantings. 2015 Duckhorn Three Palms Vineyard, Napa Valley: Wow, an honor to receive the Wine Speculator number one wine of the year. That kind of recognition is high praise, and from my estimation, it's likely well deserved. A Right Bank like blend, featuring 91% Merlot, and the blending varietals Cab-Sauv, Petit Verdot and Cab-Franc perfuming the aromas bouncing from the glass like wood -nymphs on crack. 2015 Duckhorn Napa Valley Merlot: The color is far more garnet, the structure is quite complex and layered. Rich cherry, dark plum, leather, floral notes, licorice, baked blueberries, and a rich earthiness. It's loaded with red and dark fruits, enough acid to carry the day and the structure to last many years in the bottle. The mid-palate is round and mouth coating, overall this wine is very generous, the finish is long and lasting. I'd definitely tuck away a few of these gems, and drink sooner rather than later, it's showing very well at the moment. But I think a couple more years in the cellar would add a nice level of maturity to what I experienced. My score for this wine is 91 points, and another solid Merlot dominated wine that will change everything you think you know about this wonderfully engaging varietal. The 2015 vintage is looking extremely good, in an overall sense, and not just domestically either, as I reported earlier regarding pre-release Bordeaux, that vintage in the parlance of today's youth is lif AF. The two wines in the reviews above are just a small slice of the wine drinking joy to be found in the Right Bank styles of Merlot wines from Duckhorn and many other domestic producers. If you've still not availed yourself of the opportunity to experience the wines of Duckhorn Vineyard, then you owe it to yourself to see what the 'fuss' is all about. If you do, I think you too will become captivated by these well-crafted wines. Until then folks, as always remember life is short, so sip long and prosper cheers!